Need-to-know info about the things that make you itch — and tips to help you stop. This article was originally published November 29, 2018. If sneezing, wheezing and itchy rashes are all too familiar to you, you're in good company. About one in four Canadians suffers from seasonal allergies, while almost three million experience food allergies — and the numbers continue to rise. One major explanation for this could be the hygiene hypothesis, which suggests that our over-sanitized living spaces make our bored immune systems overreact to benign things in their environment. Yet despite how common allergies are, misconceptions about their symptoms, causes and cures abound. Read on for some lesser-known facts and tips about five common human allergens — and how to tell if you're really allergic to that bagel or not. Although gluten-free diets are all the rage these days, only 0.4 per cent of Canadians report having a true wheat allergy. And because people often confuse a food allergy and an intolerance, let's break down the difference. Allergic reactions rapidly activate the immune system, leading to potentially life-threatening, multi-organ symptoms such as hives, throat swelling and vomiting, usually within an hour of ingesting even tiny amounts of an allergen. On the other hand, food intolerance reactions typically occur within hours to days after exposure, prompted by the lack of certain digestive enzymes or sensitivities to food additives or chemicals. This can result in bothersome belly issues including gas, bloating and diarrhea, or less specific symptoms such as headache and fatigue. In terms of non-celiac gluten sensitivity, a 2015 study suggested that only 14 per cent of adults who think they have it actually do — so that pizza splurge might not be what's ailing you after all. Tip: If you get consistent stomach upset after eating wheat, see your doctor to get tested for celiac disease. Although it only affects one per cent of the world's population, it can lead to serious health conditions including vitamin deficiencies and small bowel cancer if left untreated. Think those itchy lips you get whenever you eat certain fruits are caused by a pesticide allergy? Think again. It's far more likely that you have a condition called oral allergy syndrome (OAS), which can result in localized itching, swelling and redness when your mouth and throat react to direct contact with certain plant proteins. Although, in rare cases, OAS can cause more serious symptoms like wheezing or full-blown anaphylaxis, most of the time it's merely an annoyance that fades after about half an hour. Interestingly, OAS typically develops after hay fever due to a case of mistaken identity. Because some fruits and vegetables contain proteins that are similar to some pollen proteins, your immune system can develop a reaction to them, too — which explains why more than 50 per cent of seasonal allergy sufferers may also experience OAS. Tips: Since problematic proteins are found in fruit and vegetable skins, peeling them may help reduce the itch. Heat can also help neutralize these foods, so poach, bake and boil away. Because climate change is leading to longer, hotter and drier warm-weather months with more sneeze-inducing pollen, allergy sufferers may be in for even worse symptoms in future years. And if you think you can tough things out without allergy remedies, keep in mind that you may be doing yourself a long-term disservice. 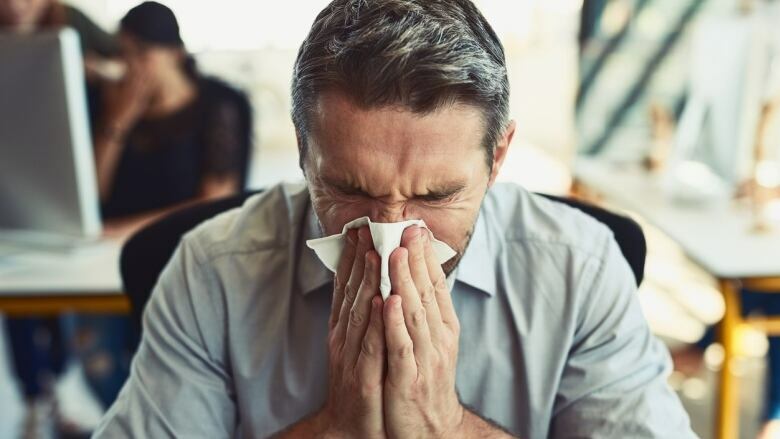 Letting your overreacting immune system and inflammation run amok can increase your risk of developing chronic conditions including allergic asthma, sinusitis and insomnia. OAS symptoms also typically improve when you stay on top of your seasonal allergies. Tips: Avoidance is the name of the game, so wear a hat and sunglasses, dab petroleum jelly around the rim of your nostrils to prevent pollen from drifting inside and keep your windows shut during allergy season. If you're rinsing, spraying and self-medicating with minimal relief, consider getting a referral to an allergist for desensitization therapy. The most commonly reported food allergy among Canadian kids is to peanuts, clocking in at 2.4 per cent of all children in a recent survey. Ironically, one reason for its growing prevalence may be the former recommendation that parents delay the introduction of nuts until babies are three years old. Researchers now suspect that if your immune system encounters food proteins first via a disrupted skin barrier (imagine cuddles from Chef Dad or peanut-butter kisses from sister) instead of the digestive tract, it's more likely that it will mis-categorize them as foreign invaders instead of the benign nutrients they are. The skin theory could also explain why coconut allergies are becoming more common as people increasingly turn to coconut oil as a topical moisturizer and cure-all. Tips: Physicians now recommend that most babies should be introduced to allergenic foods when they're between four and six months old. Also, be sure to rinse baby's skin with water to remove wet-wipe residue when cleaning up after meals, because soaps can disrupt the skin barrier, increasing the immune system's chances of reacting inappropriately. These microscopic arachnids win the prize for most common indoor allergen, inducing itchy eyes and watery noses in about 20 million Americans. Poop's the word when it comes to what ails you, as the main culprit is a specific protein in the waste pellets they produce once they munch through hair and dead skin cells. Disturbingly, one of the reasons they prefer to live in your bed is because they can't survive in dry environments — and humidity levels rapidly increase once you slide into the sheets each night. And although a 2014 meta-analysis showed that encasing one's mattresses in a mite-proof cover reduced local dust-mite levels by 80 per cent, as a single intervention it had no meaningful effect on overall allergy symptoms, meaning a more comprehensive strategy may be needed. Tips: Use a dehumidifier to keep the humidity in your home, and bedroom especially, below 50 per cent. Avoid wall-to-wall carpeting and vacuum upholstery regularly. Wash bedding weekly and opt for a tightly woven duvet to keep mites out. And finally, embrace messiness: a recent study from the UK showed that exposing your sheets to the air by leaving your bed unmade in the morning could significantly reduce dust mite numbers. Dr. Melissa Lem is a well-travelled family doctor, on-air medical expert and clinical instructor at the University of British Columbia. Follow her tweets about health, nature and the environment @Melissa_Lem. Are you allergic to your house?